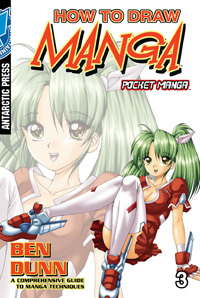 Get all the bountiful benefit of Antarctic's How to Draw Manga series, now in a more portable, ready-to-use format! Antarctic Press brings you the collective experience of its stable of manga artists in this newly arranged edition. This volume brings you character design with a special focus on villains, drawing guns and swords, and creating monsters, both human and inhuman. Every section presents a drawing lesson, with the final page set up like a sheet of blank bristol so you can practice the lesson wherever you are! Take your How to Draw on the road, in the air—anywhere!